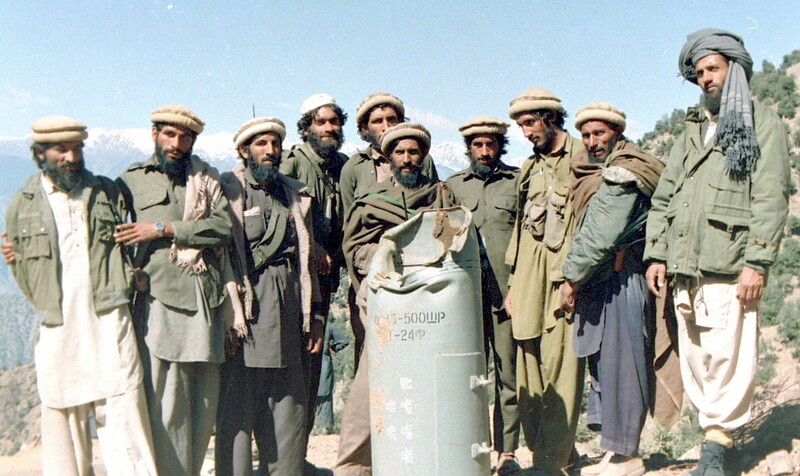 Kunar Shultan Valley mujaheddin 1987 – Pazlimalek is 4th from left. High above Asadabad, on two mountain plateaux to the east and one to the west of the Kunar River, Soviet Spetsnaz commandos have established small permanent bases that are regularly supplied from the valley by helicopters, mostly at night. Four helicopters were parked on the tarmac of an airfield at Asadabad when the fighting around Shigal Tarna began, Pazlimalek claimed that each of the three mountain bases, Soder Sar, Mechellay Sar and Shahbazay Sar, housed about 300 Soviet commandos. According to Ajab Khan, the Spetsnaz have a Bimsiezda on Soder Sar, only a few kilometres to the south of Tari Sar mountain and clearly visible from the highest peak above this plateau. The mujaheddin count 13 rockets in the first salvo. A second salvo blasts the same mountainside across the valley with nine rockets but all fail to hit the mujaheddin mortar and Bimyak positions. In the north [north of Asmar, where I went with another group of Yunus Khalis mujaheddin two years earlier, in August 1985], the mujaheddin control a number of villages along the river itself and have laid siege to the government garrison of Barikot near the border with Pakistan. In a major offensive during the spring of 1985, a division-sized Soviet force [in hindsight I’m sure I was misinformed about this — there is no way the force could have been that large] backed by an estimated 100 warplanes and helicopters fought its way up the narrow dirt road along the Kunar to relieve the besieged garrison at Barikot, using airborne Spetsnaz commandos to destroy as many as nine anti-aircraft machine-gun posts that the mujaheddin had set up on mountain peaks overlooking the valley. The Soviets managed to bring Afghan army reinforcements to Barikot but as soon as the main Russian force returned to the south the mujaheddin retook control of almost the entire stretch of road between Asmar and Barikot, established fresh machine-gun nests in the mountains and resumed their siege of the border garrison. In May last year, Soviet jets destroyed an important bridge across the Kunar River between the villages of Sao and Neyshagam north of Asmar in an effort to deny the mujaheddin an easy way to cross to the west bank with their mules laden with heavy arms. According to Pazlimalek, the mujaheddin have since stretched at least three cables across the river and use rafts to transport heavy weapons and ammunition, and they are trying to repair the Sao bridge as well as another one at Narei further north.